First of all you should know what your budget is. How much are you willing to spend or can you spend on a monthly or weekly basis for this hobby or privacy/security of yours? Write that down. This is where you will store your files from the torrents you will be downloading. I would personally suggest you not to go for something small (based on my needs at least). If the speed doesn’t matter that much to you, go for an HDD, but if you want to rule that section and you are going for a 500MBps+ speed go for an SSD; it will upload way faster. 3. How fast can you upload and is there a limit? I would personally suggest you to go for better upload speed and unlimited or as high as possible (if that is possible) than download since I guess you will be mainly using this to boost your ratio, and also to give back at the community like I previously said and not hit and run (hit&run is when you download a torrent fast and you don’t upload a thing or almost nothing, that is number 1 reason to get banned from a private tracker). Of course you will be using the seedbox for your privacy and safety, duhh… I didn’t forget that I am just giving you a few more reasons, so choose this wisely. So what kind of customer support does it offer and is it good/fast? Better support usually means faster/quicker problem solver (if you get any that is, I hardly get any, I mainly mess things up myself and get support to fix my mess lol..) which can be crucial in some cases. Test them out with a pre-sales question/s (if you wish) and look at reviews, if you can find out any. Where is your seedbox located? Does this even matter? Well it is not that important in my opinion (I am based in EU though so that’s basically why, most seedboxes are in EU so they connect fast to each other and I can grab my files fast from them). But if you want to be serious about this, check out where your private tracker is located (or at least the majority of the users) and how fast you ping to your server. Closer location = lower ping = faster speeds. You don’t want to grab a seedbox from USA for example, for a tracker in Asia, when you are located in EU (what a mess!) since none will enjoy this seedbox. By the way I would suggest you to go for a non USA seedbox anyway since with all that chaos going on over there nowadays it doesn’t seem safe. If you are an American though you can try a Canadian Seedbox and if that doesn’t work out go for a USA based one. 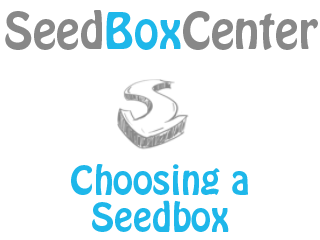 Ask for a test file to check out how well your home connection can connect to the seedbox and what kind of speeds to expect. – Does it allow public trackers? For example Thepiratebay. Most of the providers don’t allow them. If that is important for you find one that does allow them. – Does it have a trial period? If it does, you can first try the seedbox out, see if that fits your needs (speed wise for example. You can always request to download a test file from almost all the seedbox companies, to see the speed yourself though) before you buy it. – Pay full price or got a coupon? Check out our site for special offers and coupons; you can possibly save a few euros/dollars! So these are the basic stuff you need to check out before you buy/rent a seedbox. This list of course is based on my own priorities. Some might prefer speed over space or download over upload for example. But if you want to build up your ratio I would suggest you go for upload speed. I do agree though that in some cases smaller space/HDD and faster connection can do amazing stuff (However, for very high speeds you will usually need an SSD, otherwise you will be limiting your speed based on your “slow” HDD)! Are you ready to choose your seedbox now? Get started by going through our offers section! Next chapter will be about “No idea yet :P“.. I think now it is a good time to start adding some offers! !